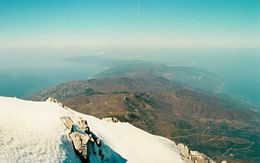 Mount Athos (Greek: Όρος Άθως) a mountain in Macedonia, northern Greece, also called in Greek Άγιον Όρος (Ayion Oros or Agion Oros) "Holy Mountain." Its area is 130 square miles (336 square km). Mount Athos is home to 20 Eastern Orthodox monasteries and forms a semi-autonomous, self-governing monastic state within Greece. Spiritually, Mount Athos comes under the direct jurisdiction of the Ecumenical Patriarchate of Constantinople. Though land-linked, the habitable peninsula of Mount Athos is accessible only by boat. The number of visitors is restricted and all are required to get a special entrance permit before entering. Only males are allowed entrance, and Orthodox Christians take precedence in the permit issuance procedure. The current population is around 2,250. Only males over the age of 18 who are members of the Eastern Orthodox Church are allowed to live on Athos. The monasteries of Mount Athos possess some of the world's most significant examples of Byzantine art, Orthodox icons, and both religious and literary treasures. Its libraries contain a vast collection of rare ancient and medieval manuscripts. 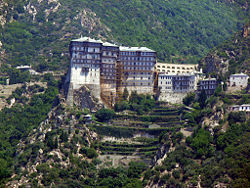 Mount Athos has been a UNESCO World Heritage Site since 1988. 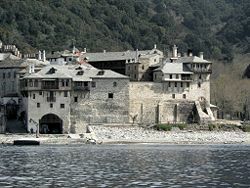 Its description reads: "An Orthodox spiritual center since 1054, Mount Athos …is a recognized artistic site. The layout of the monasteries had an influence as far afield as Russia, and its school of painting influenced the history of Orthodox art." 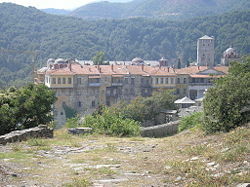 Although isolated from the outside world, Athos has been the home of many influential monks and has had a significant impact on the development of the Orthodox tradition. It has also witnessed several major theological controversies. 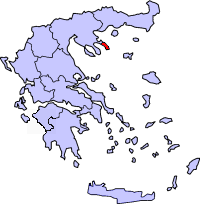 The location of Mount Athos in Greece in indicated in red. In the context of Greek mythology Athos was the name of one of the Giants that challenged the Greek gods. Athos threw a massive rock against Poseidon which fell in the Aegean Sea and became the Athonite Peninsula. According to another version of the story, Poseidon used the mountain to bury the defeated giant. Herodotus relates that Pelasgians from the island of Lemnos populated the peninsula, then called Acte or Akte. (Herodotus, VII:22) Strabo reports of five cities on the peninsula: Dion (Dium), Cleonae (Kleonai), Thyssos (Thyssus), Olophyxos (Olophyxis), and Acrothoï (Akrothoön), of which the last is near the crest. (Strabo, Geography, VII:33:1) Eretria also established colonies on Acte. Two other cities were established in the classical period: Acanthus (Akanthos) and Sane. Some of these cities minted their own coins. The peninsula was on the invasion route of Xerxes I, who had a channel excavated across the isthmus to allow the passage of his invasion fleet in 483 B.C.E. After the death of Alexander the Great, the architect Dinocrates (Deinokrates), proposed to carve the entire mountain into a statue of Alexander. The history of the peninsula during latter ages is shrouded by the lack of historical accounts. Archaeologists have not been able to determine the exact location of the cities reported by Strabo. It is believed that they may have been deserted when Athos' new inhabitants, the monks, started arriving at some time before the seventh century C.E..
Iviron monastery lies near the site where according to tradition Mary first landed on Athos. According to tradition, the Blessed Virgin Mary was sailing, accompanied by Saint John the Evangelist, from Joppa (Israel) to Cyprus to visit Lazarus in the first century C.E., when the ship was blown off course to then-pagan Athos. It was forced to anchor near the port of Klement, close to the present monastery of Iviron. The Virgin walked ashore and, overwhelmed by the natural beauty of the mountain, she blessed it and asked Jesus for it to be her garden. A voice was heard saying, "Let this place be your inheritance and your garden, a paradise and a haven of salvation for those seeking to be saved." From that moment, the mountain was consecrated as Mary's garden and was out of bounds to all other women, although thousands of men would be welcomed there. Historical documents on ancient Mount Athos are very few. It is clear that monks were already there since the fourth century, or possibly since the third. During Constantine I's reign (324-337), both Christians and pagans were living there. During the reign of Julian the Apostate (361-363), the churches of Mount Athos were destroyed, and Christians reportedly hid in the woods and inaccessible places. Later, during Theodosius I's reign (383-395), the pagan temples were in turn destroyed by the Christians. However, the lexicographer Esychios the Alexandrian states that in the fifth century there was still a temple and a statue of "Zeus Athonite." After the Islamic conquest of Egypt in the seventh century, some monks from the Egyptian desert came to the Athos. An ancient document states that monks "… built huts of wood with roofs of straw … and by collecting fruit from the wild trees were providing themselves improvised meals …"
Zograf monastery is one of the most ancient monasteries on Athos, founded during the reign of Leo VI the Wise. By the eighth century monastic establishments at Mount Athos were well attested. Theophanes the Confessor (late eighth century) wrote that the eruption of the Thera volcano in 726 was visible from Mount Athos. 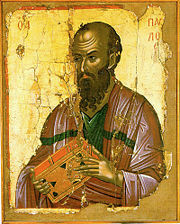 The historian Genesios recorded that at the seventh Ecumenical Synod of Nicaea (843) monks from Athos were in attendance. 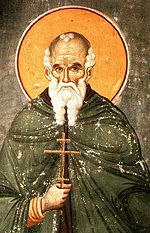 Around 860, the famous monk Efthymios the Young came to Athos and a number of monastic huts were created around his place, possibly near Krya Nera. During the reign of emperor Basil I the "Macedonian," the churchman Basil the Confessor built a small monastery at the site of the modern harbor of Chelandariou Monastery. Soon after, Ioannis Kolovos built a monastery at Megali Vigla. A document of Emperor Basil I, dated 885, proclaimed the Holy Mountain as a place of monks, stating that no laymen, farmers, or cattle-breeders were allowed to settle there. In 887, some monks complained to Emperor Leo the Wise that the monastery of Kolovos had grown to such an extent that it was losing its peacefulness. The existence of a Protos ("First monk"), who is the head of the monastic community, is documented by 943, when the borders of the monastic state were precisely mapped and Karies was already the capital town and seat of administration. 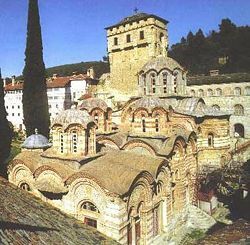 In 958, the politically influential monk Athanasios the Athonite arrived at Mount Athos, and in 962 the central church of the "Protaton" in Karies was built. In the following year, with the support of Athanasios's friend Emperor Nicephorus Phocas, the monastery of Great Lavra was founded, which is still the largest and most prominent of the 20 monasteries existing today. It enjoyed the protection of the emperors of the Byzantine Empire during the following centuries and its wealth and possessions grew considerably. The Fourth Crusade in the thirteenth century brought new Roman Catholic overlords. Athos was raided by Catalan mercenaries in the fourteenth century, a period that also saw the theological conflict over the mystical practice of hesychasm practiced on Mount Athos and defended by Gregory Palamas. 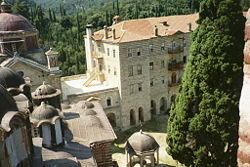 Stavronikita monastery was the last monastery to be founded on Athos. The Byzantine Empire was conquered in the fifteenth century and the newly established Islamic Ottoman Empire took its place. The Athonite monks tried to maintain good relations with the Ottoman sultans, and when Murad II conquered Thessaloniki in 1430 they immediately pledged allegiance to him. In return, Murad recognized the monasteries' properties, which Mehmed II formally ratified after the fall of Constantinople in 1453. In this way the Athonite independence was somewhat guaranteed. 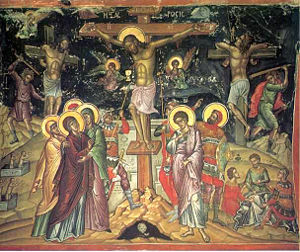 The fifteenth and sixteenth centuries were particularly peaceful for the Athonite community. This led to relative prosperity for the monasteries. An example of this is the foundation of the Stavronikita monastery, which completed the current number of Athonite monasteries. 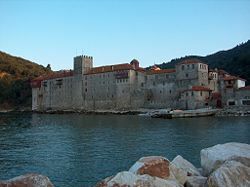 Following the conquest of Serbia by the Ottomans, many Serbian monks came to Athos. The extensive presence of Serbian monks is evidenced by the numerous elections of Serbian monks to the office of the Protos during the era. Sultan Selim I was a substantial benefactor of the Xiropotamou monastery. In 1517, he issued a fatwa pledging that any fire damage suffered by the monastery would be restored at the state's expense. He also financed the construction of the dining area and underground area of the monastery's Abbey, as well as the renovation of wall paintings in the central church that were completed between the years 1533-1541. Despite the fact that most of the time the monasteries were left in peace, the Ottomans heavily taxed them and sometimes seized important land parcels from them. This eventually culminated in an economic crisis in Athos during the seventeenth century, leading to the adoption of the semi-hermetic lifestyle by several monasteries and later, during the first half of the eighteenth century, by all of them. Contrary to the more community-oriented cenobitic system, monks in idiorythmic communities have private property, work for themselves, are responsible for acquiring their own food and other necessities, and dine separately in their cells, only meeting with other monks at church. Meanwhile, the monasteries' abbots were replaced by committees and at Karyes, and the Protos was replaced by a four-member committee. Aghiou Panteleimonos monastery traditional home of Russian monks was the main theater of the Imiaslavie dogmatic controversy during the early twentieth century. Until the end of the fifteenth century, Russian tzars, and princes from Moldavia, Wallachia, and Serbia had helped the monasteries to survive. The population of monks and their wealth declined over the next centuries, but were revitalized around the nineteenth century. In 1912, during the First Balkan War, the Ottomans were forced out by the Greek Navy. In June 1913, a small Russian fleet, consisting of the gunboat Donets and the transport ships Tzar and Kherson, delivered the Archbishop of Vologda and a number of troops to Mount Athos to intervene in the theological controversy over imiaslavie (a Russian Orthodox movement, later declared a heretical teaching, that the name of Jesus as God is identical with God Himself). The Archbishop held unsuccessful talks with the monks in question, and on July 31, the troops stormed the Saint Panteleimon Monastery. The military transport Kherson was converted into a prison ship and several imiaslavtsy monks were sent to Russia. After a brief conflict between Greece and Russia over sovereignty, the peninsula formally came under Greek sovereignty after World War I. According to the Decree passed by the Holy Community on October 3, 1913 and the international treaties of London (1913), Bucharest (1913), Neuilly (1919), Sèvres (1920), and the Lausanne (1923), the self-governed region of the Holy Mountain is considered part of the Greek state. 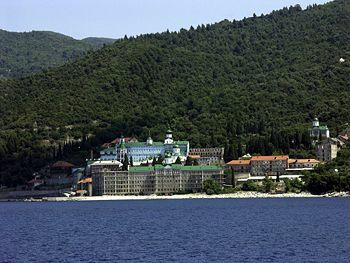 According to the constitution of Greece, Mount Athos is politically self-governed and consists of 20 main monasteries together with the capital city and administrative center, Karyes, which is also home to a governor as the representative of the Greek state. The status of the Holy Mountain was expressly described and ratified upon admission of Greece to the European Union. 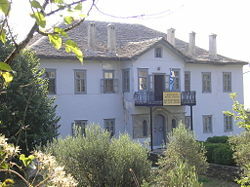 The monks of the Esphigmenou monastery have been strong opponents of Ecumenism. In recent years, the Mount Athos monasteries have repeatedly been struck by wildfires, e.g., in August 1990, and in March 2004, fire gutted a large section of the Serbian monastery, Hilandar. Due to the secluded locations of the monasteries, often atop small hills, as well as the unavailability of suitable fire fighting gear, the damages inflicted by these fires are often considerable. 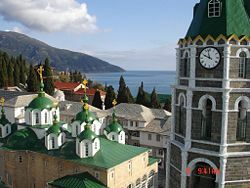 The fiercely Orthodox monasteries of Mount Athos have a history of opposing ecumenism or movements towards reconciliation between the Orthodox Church of Constantinople and the Roman Catholic Church. The Esphigmenou monastery is particularly outspoken in this respect, having raised black flags to protest against the meeting of Patriarch Athenagoras I of Constantinople and Pope Paul VI in 1972. Esphigmenou was subsequently expelled from the representative bodies of the Athonite Community. The conflict escalated in 2002, with Patriarch Bartholomew I of Constantinople declaring the monks of Esphigmenou an illegal brotherhood and ordering their eviction; the monks refused to be evicted, and opposed their replacement with a new brotherhood. On September 12, 2004, the Eastern Orthodox Patriarch of Alexandria, Peter VII—who was on his way to Mount Athos—was killed, together with 16 others, in a helicopter crash in the Aegean Sea off the peninsula. The cause of the crash remains unknown. The Holy Mountain is governed by the "Holy Community" (Iera Kinotita), which consists of the representatives of the 20 Holy Monasteries. There is an executive committee, the four-membered "Holy Administration" (Iera Epistassia), with the Protos being the head of it. Civil authorities are represented by the Civil Governor, appointed by the Greek Ministry of Foreign Affairs, whose main duty is to supervise the function of the institutions and the public order. Spiritually, Mount Athos comes under the direct jurisdiction of the Ecumenical Patriarchate. In each of the 20 monasteries—which today all follow the coenobitic system—the administration is in the hands of the "Abbot" (Igoumenos) who is elected by the brotherhood for life. He is the lord and spiritual father of the monastery. The Convention of the brotherhood is the legislative body. All the other establishments (cloisters, cells, huts, retreats, hermitages) are dependencies of some of the 20 monasteries and are assigned to the monks by a document called "homologo." Beyond the monasteries, there are 12 sketae, smaller communities of monks, as well as many (solitary) hermitages throughout the peninsula. All persons leading a monastic life on Mount Athos acquire Greek citizenship without further formalities upon admission as novices or monks. Of the 20 monasteries located on the Holy Mountain, 17 are Greek and the other three belong to other Orthodox nationalities: the Chelandariou Monastery is Serbian, the Zografou Monastery is Bulgarian, and the Aghiou Panteleimonos Monastery is Russian. Among the 12 cloisters, two are Romanian, the coenobitic "Skiti Timiou Prodromou" (which belongs to the Monastery Meghistis Lavras), and the idiorythmic "Skiti Aghiou Dimitriou tou Lakkou," also called "Lakkoskiti" (which belongs to the Aghiou Pavlou Monastery), and another is Bulgarian, "Skiti Vogoroditsa" (which belongs to the Aghiou Panteleimonos Monastery). Entry to the mountain is usually by ferry boat from the port of Ouranoupolis in the Halkidiki prefecture. Before embarking on the boat, all visitors must have been issued a diamonitirion, a form of Byzantine visa that is written in Greek, dated to the Julian calendar, and signed by four of the secretaries of leading monasteries. There are generally two kinds of diamonitirion: the general diamonitirion that enables the visitor to stay overnight at any one of the monasteries, nor more than three days in total; and the special diamonitirion, which allows visits to only one monastery or Skiti but does not limit the length of the stay. Most visitors arrive at the small port of Dafni, from where they can take the only paved road on the mountain to the capital Karyes, or continue further by a smaller boat to other monasteries down the coast. There is a public bus between Dafni and Karyes. Taxis operated by monk taxi-drivers are available for hire at Dafni. They are all-wheel-drive vehicles since most roads in the mountain are unpaved. Upon arrival at a monastery, the visitor may ask the guest-master if and when they may see and venerate the relics and icons. They may also receive a guided tour and information about the history of the monastery. Visitors are advised that they should not miss the old church of "Protaton" with its exceptional murals and the holy icon of the Virgin Mary, called "Axion Esti," which is the household icon of the patron saint of the Holy Mountain. In order to reduce sexual temptation, women are completely barred from the peninsula, a fact which has earned a certain amount of fame. Even female domestic animals (with the exception of cats, as well as chickens, which lay eggs that provide the fresh egg yolk needed for the paint used in iconography) are forbidden. A violation of this prohibition is punished by imprisonment from one to two years. The European parliament has urged Greece twice to change this rule, but the demand was rejected. In the 1930s Aliki Diplarakou, the first Greek beauty-pageant contestant to win the Miss Europe title, shocked the world when she dressed up as a man and sneaked into Mount Athos. Mount Athos did shelter female refugees twice in its history—during the aftermath of the failed 1770 Orlov Revolt and during the Greek War of Independence in 1821. 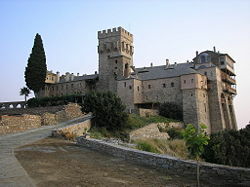 The architectural structure of the monasteries and the coenobitic cloisters consists of a cluster of sequential high buildings, which enclose an inner courtyard. These buildings were also a defensive shield and give the monasteries of Athos peninsula their characteristic castle-like appearance. There are also towers with embrasures . The portal is usually tunnel-shaped for defense purposes, and is closed by heavy iron-sheeted wooden gates. Outside and near the main entrance, there is usually a roomy kiosk with a great view. Near the center of the paved interior courtyard is the most important part of the monastery, the central church that is called katholikon, and opposite, to the west, there is the refectory, called trapeza. Other basic parts of a monastery are the Assembly room and the administration offices, the guest house, the monks' quarters, the library, and the sacristy. In front of the west entrance of the main church, there exists fiali, an ornate marble washstand containing holy water. Within the courtyard, there is a fountain with fresh water. Little chapels are interspersed at various points of the monastery. The katholikon of the Holy Mountain is a cross-shaped building, which, besides the niche of the sanctum, possesses two additional wide niches to the north and south for the choristers. Four pillars support the high central dome. To the west side of the church, between the narthexand the outer peristyle, another room has been added, called liti, where the liti service is performed. Each monastery or cloister has a small harbor to receive supplies by sea. It is called arsanas (from the Latin word arsenal) and is often fortified by a strong, high tower. Inside the churches are icon stands, sacristies, and libraries of the monasteries and cloisters containing relics and treasures of inestimable value. Such spiritual resources are of devotional, artistic, historical, or national importance, and for the pilgrims, most of them are difficult to access for security purposes. The Athonian monasteries possess huge deposits of invaluable medieval art treasures, including icons, liturgical vestments, and objects, including (crosses, chalices), codices and other Christian texts, imperial chrysobulls, holy relics, and so forth. Until recently, no organized study and archiving had been carried out, but lately a European Union-funded effort to catalog, protect, and restore them is under way. The monasteries are also home to important libraries of ancient works of great value to historians and theologians alike. For example, the Great Lavran library alone contains 2,046 manuscripts, 165 codices, and 30,000 printed books, many of them very rare. Greek is commonly used in all Greek monasteries, but in some there are other languages in use: In Saint Panteleimonos, Russian (35 monks), in Iviron Georgian (53), in Hilandar Serbian (46), in Zographou Bulgarian (15), and in the sketae of Prodromos and Lacu Romanian (64). Today, many of the Greek monks also speak English. Since there are monks from many nations in Athos (some come as far as Latin America), they also speak their own mother languages. Monastic life in the cloisters (sketae) is very different from secular life. Some of them resemble a tidy farmhouse, others are poor huts, while others have the gentility of Byzantine tradition or resemble Russian architecture of the past century. There are two types of cloisters: the cenobitic and the idiorythmic. The first, both in architecture and life-style, follows the typical model of a monastery. In contrast, the second is rather like a small village. Daily life is based on the individual monk, but there are also some duties for the community. Near the center of the settlement is the central church called kyriako, where the whole brotherhood meets on Sundays and religious celebrations. Usually there are also an administration house, a library, storehouses, and a guest house. ↑ Religious order living in a convent or community. ↑ An opening in a thick wall for a door or window, especially one with sides angled so that the opening is larger on the inside of the wall than on the outside. ↑ A room in a church housing the sacred vessels and vestments; a vestry. ↑ A portico or lobby of an early Christian or Byzantine church or basilica, originally separated from the nave by a railing or screen, or an entrance hall leading to the nave of a church. ↑ A colonnade surrounding a building or an open space, or an open space, as a courtyard, surrounded by a colonnade. All word definitions are found at www.dictionary.com. Mount Athos: The Holy Mountain (History, culture, geography and visiting information) (English). This page was last modified on 25 October 2018, at 15:30.